Sleek and sophisticated, the Estate deluxe wine tote features ThermoGuard insulation and has two compartments: one for a bottle of wine and the other to hold the amenities included. It's made of black 600D polyester and features an adjustable shoulder strap that makes it easy to carry. The Estate includes: 2 wine glasses (acrylic, 8 oz. ), 1 stainless steel waiter style corkscrew, 1 bottle stopper (nickel-plated), and 2 napkins (100% cotton, 14 x 14in, Blue and Gray Legacy Stripe design). 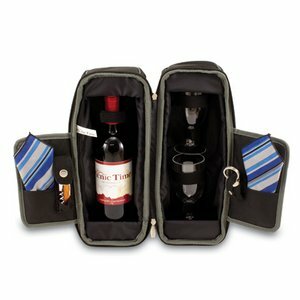 The Estate deluxe wine tote is perfect for picnics, concerts, or travel and makes a wonderful gift for those who enjoy wine.